Peter Paphides (born Panayiotis Paphides) is a British journalist and broadcaster. Between 2005 and 2010 he was employed as the chief rock critic of The Times and presented The Times’ weekly music podcast for Sounds Music supplement. Since then, he has freelanced for The Guardian, Mojo and Q magazine made a string of documentaries for BBC Radio 4 and made a pilot for BBC 6 Music show Vinyl Revival – believed to be the only networked vinyl-only radio show in the world. 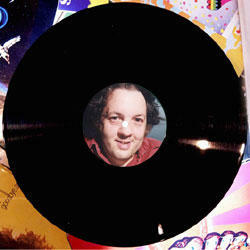 Vinyl Revival has since been commissioned for a seven-part series, which will air from December 4th, 2011. Paphides was born in Birmingham to a Greek Cypriot father, Chris, and a Greek mother, Victoria. He has an elder brother, Aki. His father ran the ‘Great Western’ fish bar in Acocks Green, and the family lived upstairs. In 1979, the family moved to the suburb of Olton, where his father ran the ‘King Fisher’ (now ‘George’s Fish Bar’). Pete was also the creator of one of the great Brum fanzines Perturbed. Paphides later wrote for Melody Maker and Time Out. Today, he is based in London. He married Times columnist Caitlin Moran in December 1999. They have two daughters.